The AA was created around 1935 with just a few members, and now has over around two million members throughout the world. 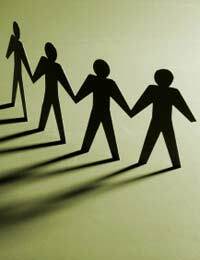 Groups meet regularly to share their experience and help support each other in their bid to get, and stay, sober. They follow guidelines called the 12 Steps which gives the path to recovery some structure. The 12 Step method was popularised by Alcoholics Anonymous (AA) but this is now adapted and used throughout most support groups including Al-Anon, the group for the family and partners of alcoholics, and Narcotics Anonymous (NA), which is for drug addicts. 12 Steps has proved hugely successful, offering a structure to quitting, and many support groups other than AA also now use the Steps, or an adapted version of their own. The 12 Steps is the backbone of the AA ethos, and it has a strong basis in religion and spirituality. This might not be for everyone, and in some cases could easily put people off. But the best way to approach this is to look at the underlying message in each point. It’s easy to remove the religious meaning from most of the points, and still be able to tackle what’s covered – such as admitting the problem (Step 1), making an inventory of yourself (Step 4) or making amends (Steps 8 – 10) . 12 Steps won’t be for everyone but the success of their track record speaks for itself. The AA is keen to point out that nobody is forced to follow these guidelines if they don’t want to, and will still be welcomed with open arms. But it’s very much about going on a journey of recovery and they use a lot of words like ‘fellowship’ and ‘reaching’, which can be a bit over the top for some people! However, the AA asks that you keep an open mind and that you simply aim to interpret the steps as suits you best. The AA also has a policy of total abstinence, recognising that alcoholism is a disease, and there is no cure except giving up completely. There’s no compromise on this and anybody arriving at a meeting drunk or hungover will be asked to leave.